The Roger Yost Salem Gallery in the Historic 1920 Vick Building in Downtown Salem, Oregon’s capital city, and within strolling distance of fine restaurants, boutiques, museums and other galleries. The gallery contains more than 12,000 square feet of exhibit space featuring original paintings by renowned and obscure contemporary, mid-century and historic artists from around the world. A coastal version of the gallery is now open in Newport, Oregon. American Art Awards has selected the Roger Yost Gallery as one of the "25 Best American Galleries" and the "Best Gallery Or Museum of Oregon" for 2017. 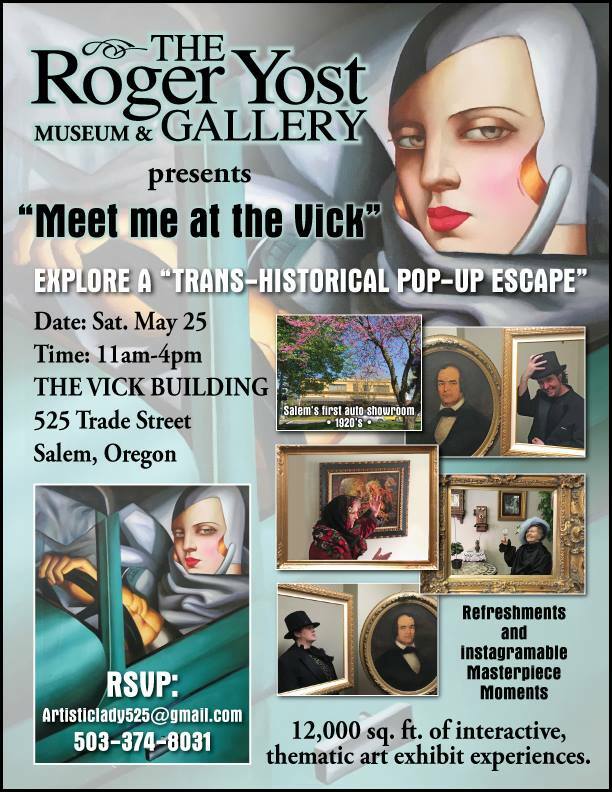 The Vick Building in Downtown Salem turns 100 in 2020 and Rebecca Maitland, curator at the Roger Yost Gallery, begins a year-long celebration May 25 when she stages a “trans-historical” exhibit (“Meet Me at the Vick”) in the iconic building. 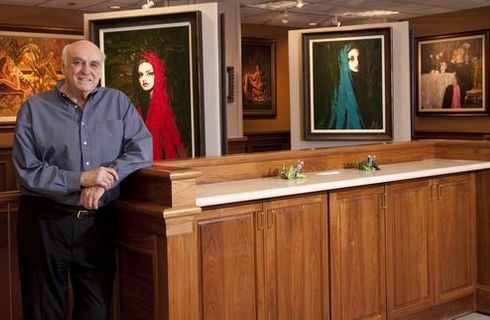 Roger Yost moved his extensive art collection and antique clocks to the spacious Vick after selling the historic Reed and Capitol Center buildings in 2018. The Vick brothers created Salem’s first automobile showroom in 1920 at the site (525 Trade Street SE), selling prestigious Packards, Ford autos and tractors, as well as the original Harleys. Ms. Maitland has since transformed the collection—which includes centuries old Dutch Masters and many contemporary works—into a temporary “Pop-up Gallery” with 16 thematic rooms. The mixing of new paintings with others dating back to the 1600s is called “transhistorical” in the art world. Among the exhibits are artworks inspired by the Franco-Prussian war of 1871, and the Battle of the Nile in which Admiral Horatio Nelson defeated Napoleon’s navy; a garden room with dramatic landscape paintings; one dedicated to the disco, and a Parisian courtyard featuring “belle epoch” scenes by post-impressionist artists Eduouard Leon Cortes and Antoine Blanchard. Other rooms feature striking portraits, Craig Bone’s wildlife, abstract art by Leonardo Nierman, and the work of the renowned Italian, Giovanni Madonini. The one-day event is scheduled from 11 a.m. to 4 p.m. on Saturday, May 25, and is free to the public. There will be several Instagramable photo op areas , where you too can become a Masterpiece. 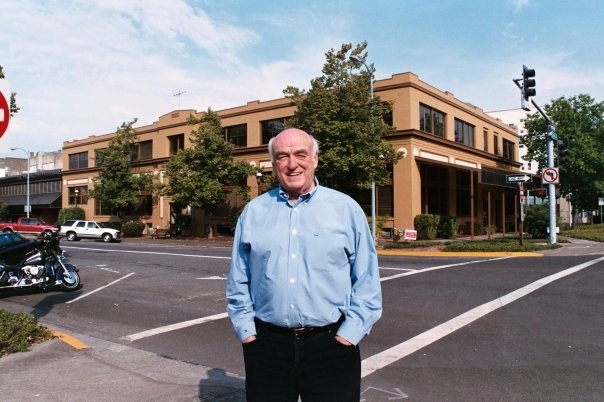 Because the building is the last of Yost’s downtown properties for sale, the eclectic collection will eventually be moved to Newport on the Oregon Coast where Yost has a permanent gallery on the bay front.